I have received two emails in the past week from users who asked me for an easy way of finding their computer’s IP address. Instead of replying to each user individually I made the decision to write it up here on Ghacks so that other users who were wondering about the same thing could benefit from it as well. It first needs to be mentioned that your computer may have multiple IP addresses. That’s the case for instance if you are currently connected to the Internet (which you may be since you are reading this text here) or if you have multiple network cards installed. 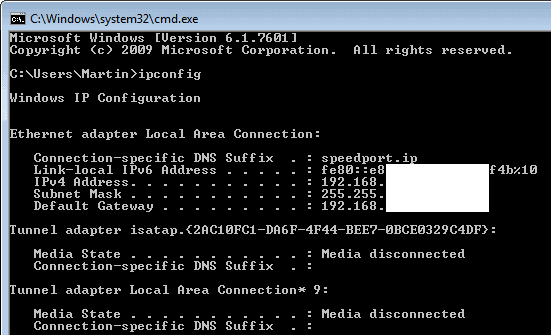 The easiest way to find out about your computer’s IP addresses is to use the ipconfig tool. Start the Windows command line with the hotkey Windows-r, typing cmd and the enter key. You cannot display the IP address that your computer has received from the ISP this way though. To find out my computer’s IP address I open http://www.ghacks.net/ip/ in a web browser of choice. 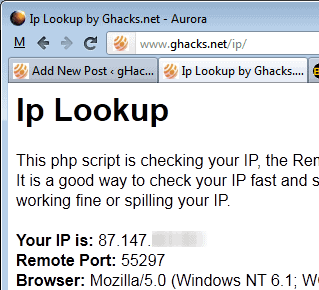 Your IP address will be shown to you along with the port and browser information. And that’s how you look up your computer’s IP address. This entry was posted in Uncategorized and tagged ip address by me. Bookmark the permalink.